Instead of coming up with a soon-to-be-abandoned New Years Resolution, I choose three words to guide thoughts and activities for the year. Inspired by Chris Brogan several years ago, it’s been so useful and effective I’ve kept it up. Consider giving it a try if you, like most of us, never see resolutions through to real change. Here are the three words impacting every day in 2019. The alliteration is mere coincidence. The meaning of this is twofold. First, I work out a lot. Good for the body but equally good for the mind. 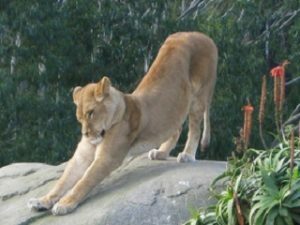 Though I happily (mostly) do the workouts, stretching was inconsistent. Stiff muscles soon turn into injury. Happens all the time. I won’t get into specifics, but there are myriads of ways a body will fight back and it can get as bad as requiring surgery. There is no downside to proper stretching and the upsides are more ease of movement of every kind, less discomfort after being sedentary for a short or long periods of time, reduction in chance of injury, and more. I’m also stretching out of my comfort zone in my business. One of the first ways that manifests is producing more short videos. Not one thing about video is comfortable so it requires some serious stretching, but I’m committed because people like videos and I have ideas that help those people. Give people what they want even if it requires stretching. Certain aspects of my business are easier and more efficient with structure. This year I’ve finally hired a bookkeeper to do things that, frankly, I just don’t like and don’t do with enough regularity. That structure makes the financial side of business a breeze. Structure is also involved in the commitment to regularly post helpful information through this blog, my Minute Shift (sign up box in right panel), LinkedIn and the videos I mentioned above. Structure around content development as well as posting. Having a structure in place means no extra brain power is required to think about what I want to share and when I want to share it. A big part of the execution process is already in place. Sometimes learning something new requires a fair amount of commitment. There are several specific topics while on my radar, haven’t been on my list of commitment. I’ve chosen three topics for this year. The materials are on-hand it’s now just carving out the time. Specifically, on the business side I have Understanding Investments from The Great Courses and the book Simple Numbers, Straight Talk, Big Profits by Greg Crabtree. Along with hiring a bookkeeper, getting more comfortable with some aspects of business finance and investing is a smart use of time. On the personal side, I want to be a better, healthier cook. The short lessons in Cooking with Vegetables (also from The Great Courses) set me up to learn in easily digestible (pun not intended) lessons. I may find other subjects to study throughout the year, simply because this word reminds me to think that way. How about you? Are there three words to help direct your actions and thinking? Maybe your New Years Resolution should be to ditch the resolution and choose three words instead!